Facial plastic surgery is not just for women. In fact, male plastic surgery has become increasingly popular in recent years. There are many procedures that can be tailored to provide men with cosmetic improvements that do not compromise the masculinity of their facial features. 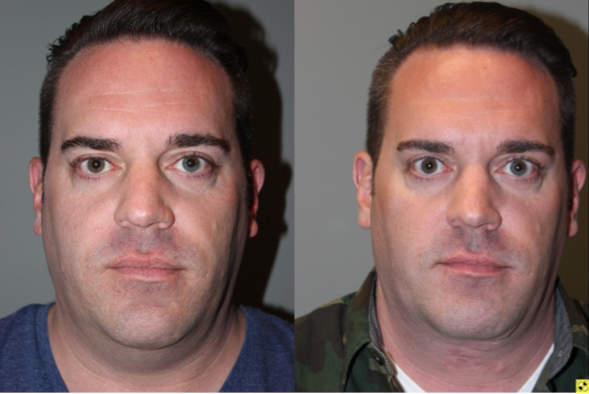 At Kalos Facial Plastic Surgery, LLC, we realize that just like women, men want to look refreshed and feel confident in their appearance too. For men, cosmetic surgery can not only make them look younger and more attractive, but it can also help them remain competitive in their occupation. While most procedures are performed similarly in both men and women, men have specific desired goals for their cosmetic surgeries. Men want a more subtle effect that makes them appear younger and more vibrant. 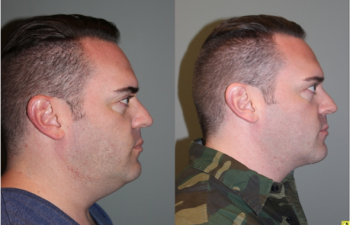 Dr. Stong understands the unique approach and techniques in plastic surgery that will bring men their ideal results while still preserving the masculine features that are considered attractive. By tailoring procedures such as rhinoplasty (reshaping of the nose), blepharoplasty (upper and lower eyelid lifts), and facelifts for men, we can correct the common concerns of aging and give men a more revitalized, defined and handsome look. Dr. Stong is highly trained to help men who are concerned with sagging neck skin (“turkey necks”), jowls, sagging upper eyelids, hair loss and more. He takes into consideration the specific factors that affect male facial plastic surgery, such as thickened, bearded facial skin that influences scarring and healing as well as the pattern of male hair growth. For men who do not want to undergo a cosmetic surgery, we offer alternatives for achieving a more youthful appearance. Injectables such as Botox are commonly used to smooth wrinkles and freshen the face. Fillers such as Juvederm can fill in deep lines and folds and take years off of a man’s appearance. These procedures are performed in the office with little to no down time. Contact our office today for more information about how Kalos Facial Plastic Surgery LLC can help you look and feel your best. Cosmetic surgery is defined by operative procedures that are purposed to modify or improve the appearance of physical features, which often involves improving the signs of aging. Male plastic surgery is tailored to provide men with cosmetic improvements while also preserving their masculinity and the distinct features that are more aesthetically pleasing in men. Dr. Stong uses specific techniques to achieve facial definition and rejuvenation in men without creating a feminine look. Why do men seek out plastic surgery and cosmetic procedures? While every patient is different, men most often seek cosmetic surgery to stay competitive in their career, to look younger and/or to feel more self-confident in their daily lives. Men also choose facial plastic surgery to simply keep up with their spouse or significant other who may regularly gets anti-aging treatments or take advantage of facial plastic surgery. What is the difference in a male facelift? 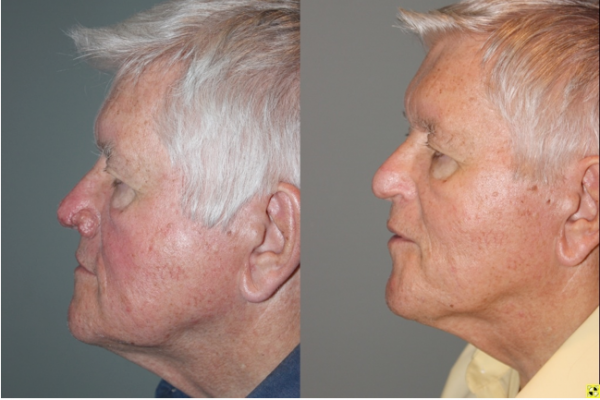 A male facelift addresses specific aging concerns for men, such as sagging neck skin (“turkey neck”), jowls, vertical neck bands and a less defined chin and jaw line. 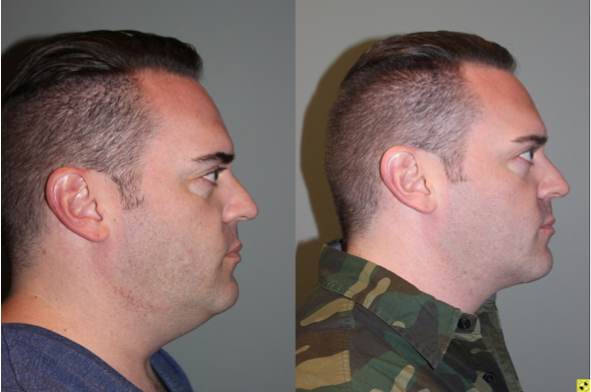 When it comes to male facelift surgery, Dr. Stong values the importance of results that look masculine and natural and not overly tight or feminine. Dr. Stong uses conservative techniques with incisions that minimize visible scarring for men with balding or short haircuts. We are known for using the most advanced facelift procedures that offer the longest possible correction for the jowl and the jaw line such as the Mini Deep Plane Facelift and the Extended Sub-SMAS Facelift. Both of these facelift surgery procedures can be performed using the smallest S-Lift or Mini Facelift incisions, and they work to lift the deeper facial tissues under the muscle instead of strict skin tightening. While the deep plane facelift technique can be accomplished in both men and women, the placement of incisions is slightly different. How is a male facelift incision different? Since men have distinctly different hairlines and hair growth patterns than women, the incisions of a male facelift differ. To accommodate male facial hair growth patterns and men’s hairstyles, the facelift incision in men is placed in the crease in front of the tragus (the small cartilage flap located right outside the ear canal) and not into the ear canal. This pre-tragal approach helps to avoid moving bearded hair-bearing skin into the ear canal when re-draping the skin during a facelift and preserves male sideburns. 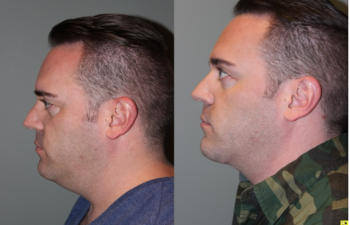 Is a direct neck lift an option for men? 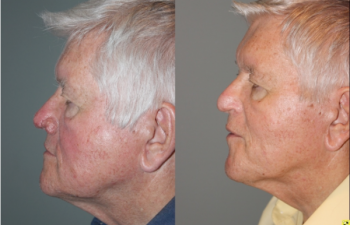 Yes, the direct neck lift is an excellent option for men who are not concerned about cheek sagging. It places incisions in the midline of the neck and is done to remove excess skin and fat as well as tighten the platysma muscles as necessary. Men are much more suited for this type of neck lift procedure since they are typically less concerned with cheek fullness or jowls or with having an incision line in the neck. What are the most common facial plastic surgeries for men? While men can significantly benefit from a male facelift or direct neck lift, blepharoplasty and rhinoplasty are most commonly requested. Blepharoplasty may involve an upper eye lift and/or lower eyelid lift with fat contouring. It can be used to address sagging upper eyelid skin, but while still preserving the heaviness in the brows that is generally considered a masculine and attractive feature. Rhinoplasty for men involves a reshaping of the nose with dedicated techniques to avoid feminizing the nose. What is a male rhinoplasty? Male rhinoplasty can be used to correct unwanted nasal features and restore proportion and balance to the facial appearance. Rhinoplasty can alter the size of the nose, correct nasal humps, reduce nostril width as well as address a bulbous tip that men commonly encounter. Dr. Stong values the importance of performing effective alterations to a man’s nose while still preserving its masculine features. For men, the nose should be proportioned with the rest of the face, but also appear strong and defined. Why do men seek nose jobs? Many men want to reduce the size of their nose, which may include alterations to the nostril width, nasal hump and/or tip of the nose. In order to create the most ideal outcome for male rhinoplasty, there must be careful adherence to reduce the size of the nose without feminizing it. 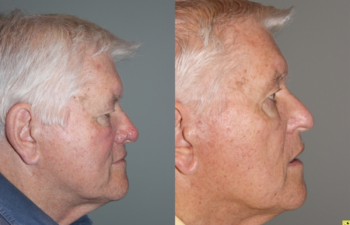 Dr. Stong uses proven techniques in male nose jobs that protect masculine nasal features and still provide improved, attractive results. What are the most important considerations in a male versus female rhinoplasty? 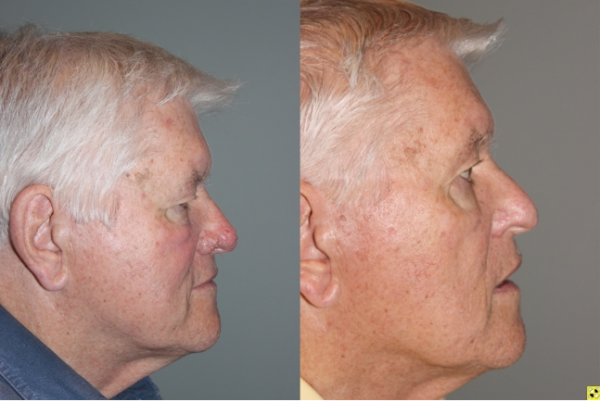 Successful male rhinoplasty should involve techniques to correct the unwanted features of the nose (such as a large size, nasal hump, crooked nose or bulbous tip) without feminizing the nose. Unlike women, who desire a refined, softened and petite nose, a strong nose is often what defines male attractiveness. Why do men get blepharoplasty surgery? The eyes are among the first facial features to show your age, especially in men. 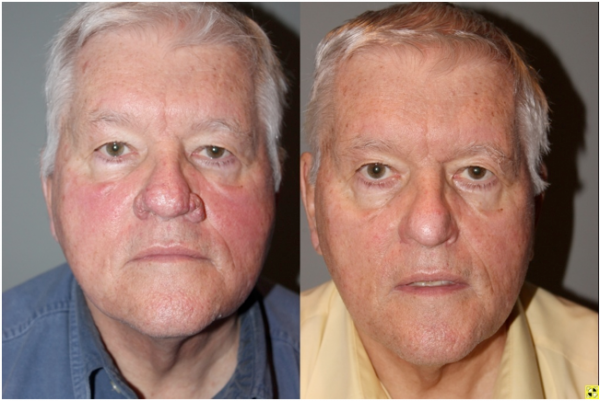 By choosing blepharoplasty, men can take 15 to 20 years off of their appearance. Blepharoplasty can address upper eyelid sagging and lower eyelid puffiness. How does hair loss impact social life? Hair loss and male pattern baldness can make men look much older than they really are. Hair loss can affect your self-confidence and even your professional career. To restore youth and vitality after hair loss, Dr. Stong proudly offers the most advanced hair transplant procedure available using NeoGraft, which produces effective permanent results with no visible scars. Typically, the best candidates for NeoGraft hair transplant are men with male pattern baldness who have an adequate and stable donor hair supply in the back of the scalp. A board certified plastic surgeon who specializes in hair restoration, such as Dr. Stong, can best determine your candidacy for hair transplantation. In general, he considers factors such as the cause of your hair loss, your age, the amount of hair in your donor area, the severity of your hair loss and your desired goals. What is the downside to hair transplant? With today’s advancements in hair transplant technology and technique, the downsides are very difficult to find. The concept of plugs, strip method scarring and other unnatural results are obsolete if you choose a skilled plastic surgeon that specializes in the latest hair restoration procedures.